More rounds to practice that perfect shot. Whether you use it for practice, training exercises or target shooting, this UMC® ammunition offers great value without compromising the quality and performance you expect from Remington®. Each bullet is made with Remington® components in the USA. 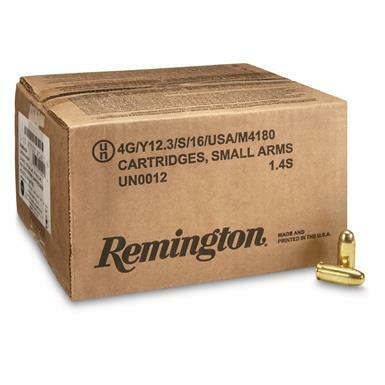 Remington UMC, .45 ACP, FMJ, 230 Grain, 500 Rounds, Loose Bulk is rated 5.0 out of 5 by 3. Rated 5 out of 5 by Slammin from Price is right on ! No malfunctions with the Colt Commander 1911 4.25 SS, S&W 1911 "C" 4.25, or the XDE 45acp 3.3. Ran flawlessly. Will keep on with UMC. Very fast shipping ! Thank you SG ! Rated 5 out of 5 by ChiMarine from Great deal for good quality ammo So impressed with this Remington UMC loose bulk ammo. Put over 100 rounds through my 1911 today without a stoppage among them. I was initially worried when I was sorting it from the cardboard box to ammo boxes for the range, and I counted 506 rounds. Figuring that Remington sold these bulk rounds by weight, having six extra in the case makes me worry some might be defective, but so far so good. Rated 5 out of 5 by Moderndefense from Quality for great price I'm impressed with the overall quality at this price point. I'll continue to buy as long as you carry it. High-quality, affordable Ammo sealed in a waterproof battle pack!